I have 42 cards of Greg Brock. This one is from 1988 Donruss. 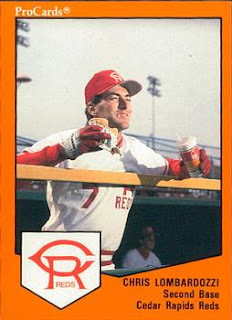 Playing career: Greg Brock was drafted by the Dodgers in 1979 and tore through the minor leagues, culminating in a 1982 season where he hit .310 with 44 HR and 138 RBI at AAA Albuquerque. In 1983 he hit 20 home runs as a Dodgers rookie but never came close to repeating his minor league success (accomplished mostly in an extreme hitters park and league) in the big leagues. Still he put up respectable numbers in his ten major league seasons with the Dodgers and Brewers he hit .248 with 110 HR and 462 RBI. Where he is now: A mostly retired youth coach in Colorado. Google Autocomplete results: He is sixth when you type Greg Bro, between Greg Brown Tour, referring to a singer, and Greg Brody, who pitched for the Giants’ AZL rookie league team last year. Another prominent Greg Brock was a character on the TV show “The West Wing”. Coming up next: The next profile will be Jermaine Brock. 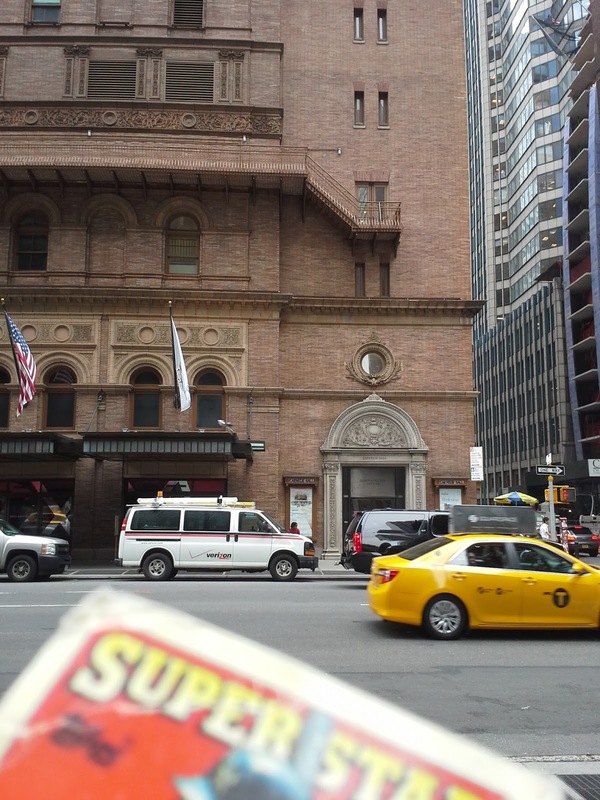 Back when I pulled a 1970 Topps Al Ferrara Story card/comic from one of my street boxes last month, it mentioned that Ferrara had played piano at Carnegie Hall as a teenager. 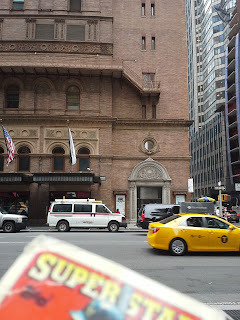 Recently I brought Wallet Card over to Carnegie Hall to take a picture. The venue has been on of the most prominent classical and popular musical halls since it's opening concert conducted by Pyotr Ilyich Tchaikovsky in 1891. I have eight cards of Doug Brocail. This one is from 1993 Donruss. 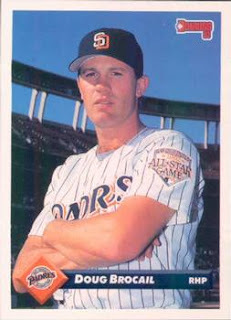 Playing career: Reliever Doug Brocail pitched for the Padres, Astros and Tigers from 1992 to 2000, at which point he suffered an elbow injury that knocked him out of the major leagues for three years. An initial misdiagnosis of the injury led Brocail to unsuccessfully sue the Tigers. He made a comeback with the Rangers in 2004 and stayed in the majors through the 2009 season. Overall in 626 major league games he was 52-48 with nine saves and an ERA of 4.00. Where he is now: Special Assistant to the General Manager & Special Pitching Advisor for the Houston Astros. Google Autocomplete results: He is tenth when you type Doug Bro, behind Doug Brown Lazard, a banker who used to be at Lazard. There do not appear to be any other prominent Doug Brocails. Coming up next: The next profile will be Greg Brock. My favorite author is PG Wodehouse, the creator of the Jeeves and Wooster and Blandings Castle series, and generally considered the finest comic author of all time. 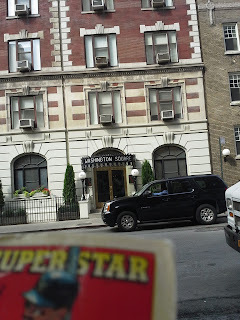 Though he was English he lived much of his life in New York, and from 1909-1914 lived in the Washington Square Hotel, then known as the Hotel Earle. Wodehouse on living in New York: "Being there was like being in heaven, withouth going to all the bother and expense of dying. I have two cards of Pete Broberg. This one is from 1978 Topps. Playing career: Pete Broberg was the number one overall pick in the 1971 draft by the Washington Senators, who immediately put him in the major league rotation. That year he went 5-9 but with a respectable 3.47 ERA. He never had as good a season again – some said it was because he needed minor league seasoning; others said the problem was in his attitude, not his arm. 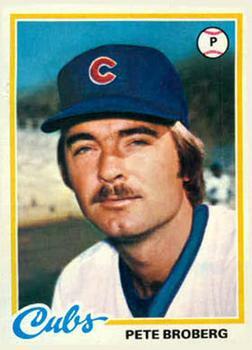 Nevertheless over eight seasons with four teams he went 41-71 with a 4.56 ERA. A fuller account of his career can be found at Cardboard Gods and the 1972Topps Blog. Where he is now: After his career he attended law school, then after passing the bar joined his father’s law firm, now known as Coe &Broberg, where he still practices, and is considered one of the leading real estate and zoning attorneys in Palm Beach. Among his former clients is possible future President Donald Trump, whom Broberg represented in a dispute over some property owned by Trump in 1991. Google Autocomplete results: He is first when you type Pete Brob, ahead of Peter Broberg MD, an eye doctor in Texas. Another prominent Pete Broberg is a musician in Ohio. Coming up next: The next profile is Doug Brocail. 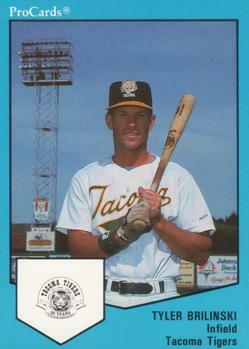 Sean Snedeker pitched in the Dodgers organization from 1988 to 1993. In 80 games he went 34-21 with a 3.24 ERA. In 1991 he pitched a perfect game against the Port St. Lucie Mets. Now the pitching coach at Oral Roberts University, he kindly answered my questions about baseball cards. 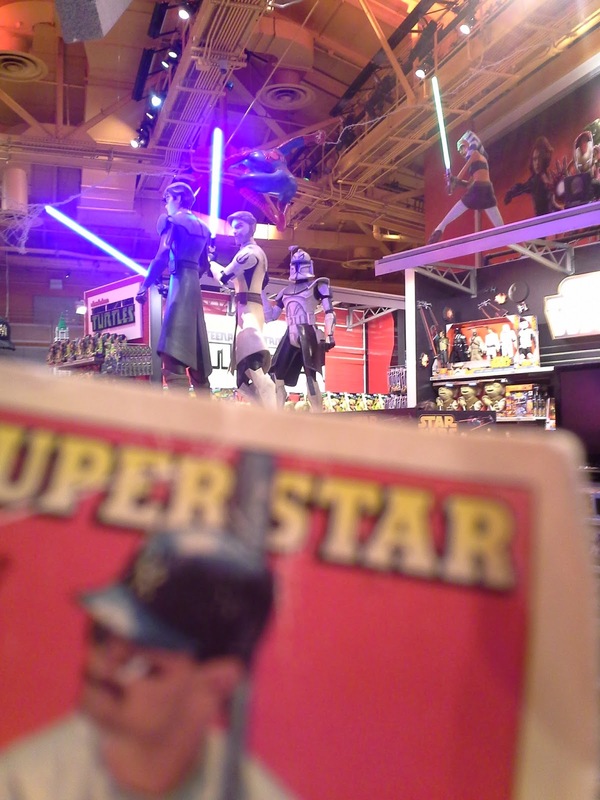 "I loved collecting cards as a kid and have done it for a large portion of my life, although not much recently. I remember back as a 4th grader or so, when me and some friends would play a really exciting game involving our card collections. We would find a wall and each lean one or two of our cards against the wall and then by “flinging” other cards in our hands, we tried to be the first to knock down our opponents cards. First one to do it, by taking turns, would win all of the cards on the floor and quite often any “good ones” that we agreed upon but would not lean on the wall or fling. Needless to say, we exchanged a lot of cards back in those days and I still have proof of which cards I added in those games due to all the dinged up corners! I feel fortunate to have several cards of myself from my playing and coaching days in the minors. Although I never played in the big leagues or had the excitement of a major league card, I was flattered with the $5 check I received from Topps early on in my minor league career. Never cashed it. Provides a great memento of minor league life. I have a good collection of cards but not many after I had kids (the last 15 years or so) so the majority of my collection is older stuff." I have three cards of Lance Broadway. 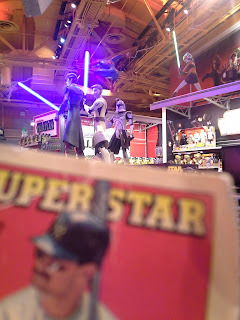 This one is from 2008 Topps Opening Day. 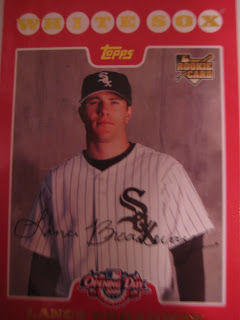 Playing career: Lance Broadway pitched for the White Sox and Mets from 2007 to 2009. In 27 games he went 2-2 with a 5.24 ERA. Where he is now: When his baseball career ended after an off-field altercation, Broadway took up acting and moved to Hollywood. His biggest role so far was ten lines in the movie Olympus Has Fallen. 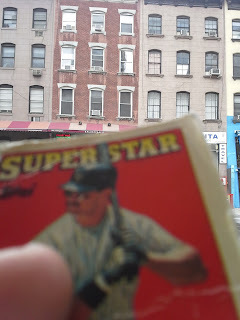 My memories: Shared his thoughts on baseball cards with this blog in 2011. Google Autocomplete results: He is eighth when you type Lance Br, between Lance Braunstein, a Managing Director at Goldman Sachs, and Lance Brasil, referring to a daily sports newspaper in that country. There do not appear to be any other prominent Lance Broadways. Coming up next: The next profile will be Pete Broberg. Bigelow Drugs, originally opened at it's current location in 1838, is the oldest apothecary in the United States. Regular customers have included Thomas Edison, Samuel Clemens (Mark Twain) and Eleanor Roosevelt. 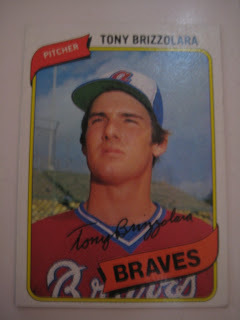 I have one card of Tony Brizzolara, from 1980 Topps. 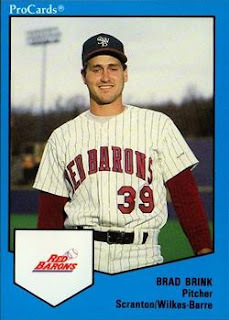 Playing career: Tony Brizzolara pitched ten seasons of professional baseball, making the major leagues with the Atlanta Braves in three of those years. Overall his major league record was 8-11 with a 5.06 ERA. A fuller account of his career can be found at 1980 Topps Blog. 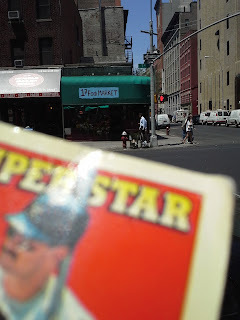 Where he is now: An actuarial consultant for Kravitz, Inc.
My memories: He shared some baseball card stories with this blog in 2009. Google Autocomplete results: He is first when you type Tony Briz, ahead of Tony Brizendine, an engineering professor at the University of North Carolina. Another prominent Tony Brizzolara is a financial advisor at Morgan Stanley. Coming up next: The next profile will be Lance Broadway. 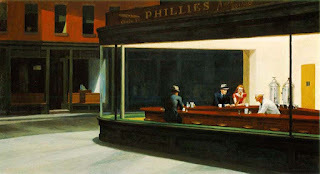 Edward Hopper's painting Nighthawks is one of the most famous modern American paintings. Though it has never been officially proven, the website NYC Popspots makes an excellent argument that the site of the picture is 70 Greenwich Avenue. 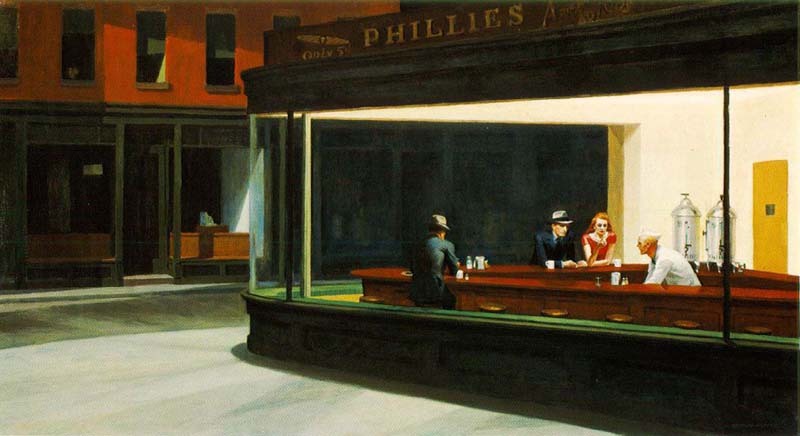 Here is the Nighthawks location today. I have two cards of Zach Britton. This one is from 2012 Topps. Playing career: Zach Britton came up with the Orioles in 2011 and struggled as a starter, struggling to keep his ERA below 5.00. 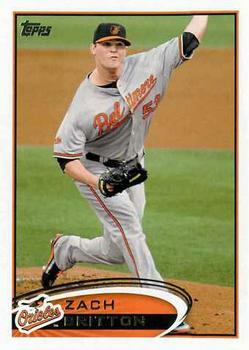 Converted to the bullpen in 2014, he blossomed as the Orioles closer, going 3-2 with 37 saves and a 1.65 ERA. Where he is now: He is having another excellent year, currently 4-0 with a 1.80 ERA, and made his first All-Star team. He last pitched on Wednesday, earning the win when he pitched a scoreless ninth and Henry Urrutia hit a walk-off home run in the bottom of the inning to beat the Mets. My memories: I remember him as a struggling starting pitching prospect. I hadn’t realized he was now the Orioles’ closer. I guess I don’t really pay attention to other team’s closers, at least until they prove themselves over several years. Google Autocomplete results: He is third when you type Zach B, between Zac Brown Band, a country music band, and Zach Braziller, a sportswriter for the New York Post. There do not appear to be any other prominent Zach Brittons. Coming up next: The next profile will be Tony Brizzolara. Yesterday Junior Junkie posted some Lego-themed wallet card pictures. 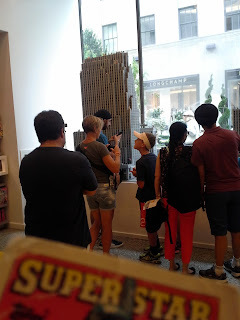 In it he showed a Lego store in Dallas that he said "while it did not have as big a selection as the Lego section of the Toys 'R' Us in Times Square, it does have a significantly bigger selection than the Lego Store at Rockefeller Center." Here are some wallet-card photos of both to compare. The Rockefeller Center store was jam-packed with tourists taking pictures, making it hard to get a good shot. Still, here is a photo of a Rockefeller Center made entirely of Legos. I am not a Lego connoisseur - when I was a kid there were just simple playsets that I would ignore and just build my own random stuff with it. The idea of a whole Lego store was improbable. The Toys R Us in Times Square has a sizable Lego area as well. 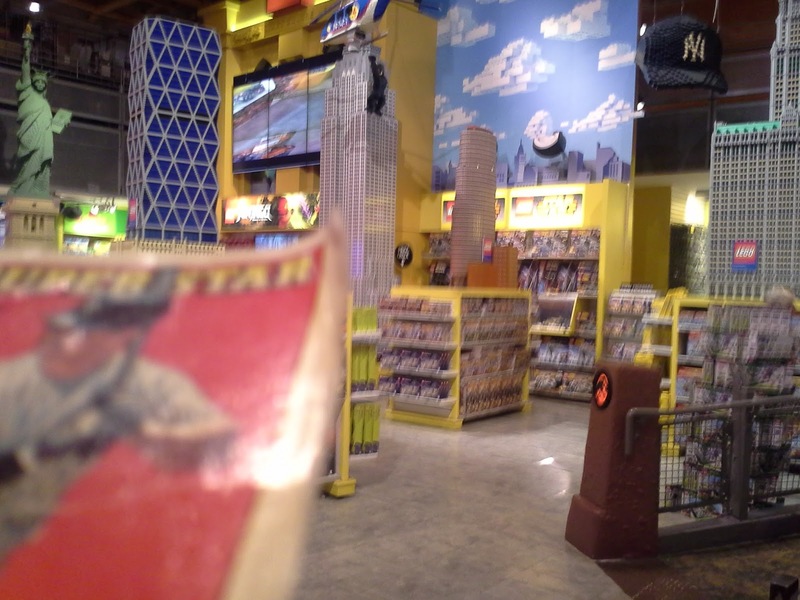 It's a different layout than the Lego store so it is hard for me to say which was bigger - both are pretty substantial. I like the layout in the Toys R Us, though. 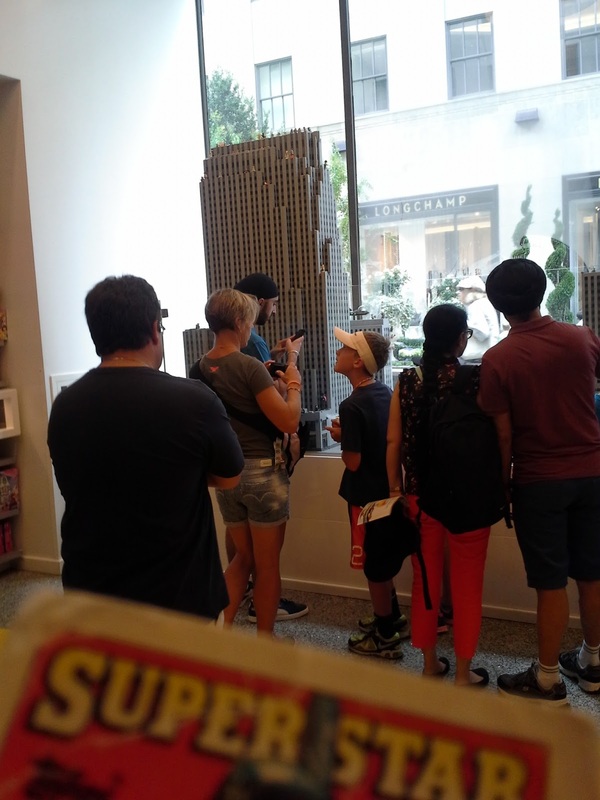 From left to right you have Lego representations of the Statue of Liberty, the Hearst Tower, the Empire State Building, the Lipstick Building, a Yankee hat, and the Woolworth Building. As a huge Star Wars fan I had to take a picture of this display in the Toys R Us, featuring life-size sculptures (not Lego) of Anakin Skywalker, Obi-Wan Kenobi, a clone trooper, and Ahsoka Tano. 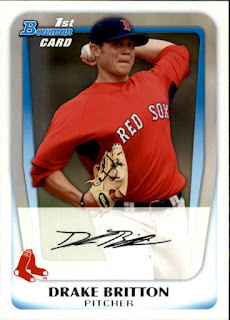 I have one card of Drake Britton, from 2011 Bowman Prospects. 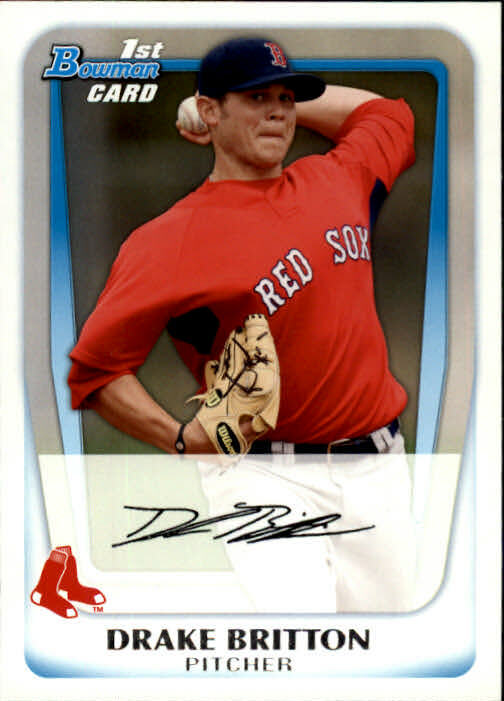 Playing career: Drake Britton pitched in 25 games for the Red Sox in 2013 and 2014, going 1-1 with a 2.93 ERA. Where he is now: Waived by the Red Sox before 2015 Spring Training, he was picked up by the Cubs. In 25 games (10 starts) at AAA Iowa he is 7-8 with a 5.47 ERA. Interesting facts: Before a spring training start in 2013 he was arrested for drunk driving after going 111 mph in a 45 mph zone. Google Autocomplete results: He is third when you type Drake Br, between Drake Brand New Lyrics and Drake Break Up Songs, both of which refer to a singer. There do not appear to be any other prominent Drake Brittons. Coming up next: The next profile will be Zach Britton. NYC's grid street pattern makes it very easy to find your way around. The north-south avenues are 1st, 2nd, 3rd, Lexington, Park, Madison, 5th, 6th, 7th, 8th, 9th, 10th and 11th. Notice a missing number there? There used to be a 4th Avenue, but railroad tunnels were built under much of it in the 1890s and 1900s. The city planted a landscaped garden path above the tunnel, and the street was renamed Park Avenue above 32nd Street. Later in the century Park Avenue became a highly desirable address, and residents of the lower part of 4th Avenue petitioned to have their address changed to Park Avenue. In 1959, the stretch of 4th Avenue from 14th Street to 32nd Street was renamed Park Avenue South. 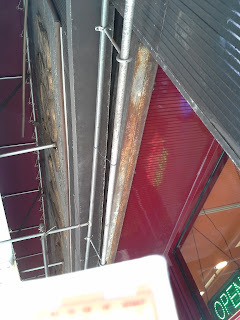 However, a bit of Fourth Avenue remains on the corner of 23rd Street, on the side of an office building. 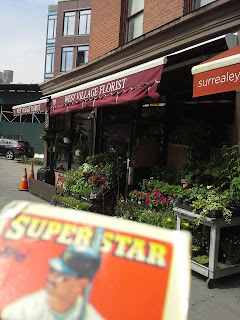 For more on Fourth Avenue including a tour of the six blocks that remain with the Fourth Avenue name, check out the always-terrific Forgotten New York. I have three cards of Chris Britton. This one is from 2007 Topps. Playing career: Chris Britton pitched for the Orioles and Yankees from 2006 to 2008. In 78 games, all in relief, he went 0-3 with a 3.83 ERA. 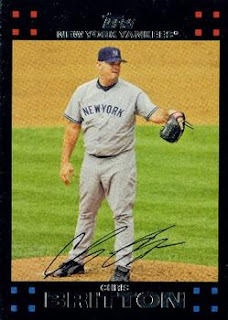 My memories: I remember him mostly for being heavy, at a time when the Yankees were signing a lot of very large pitchers. Where he is now: Anyone know where Chris Britton is now? Google Autocomplete results: He is fourth when you type Chris Brit, ahead of Chris Britt, an editorial cartoonist. Another prominent Chris Britton is an actor. Coming up next: The next profile will be Drake Britton. 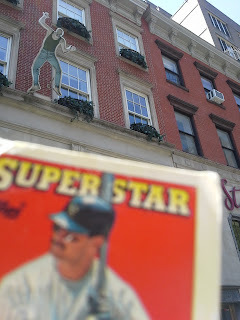 Got some terrific cards from blogger and COMC guru SpastikMooss of The Great Sports Name Hall of Fame. He finished off a couple of sets where I only needed one card to finish off. This Flair Wave of the Future insert made me think of Gavin of Baseball Card Breakdown. No actual liquid in this card though. An autograph of D.J. Boston, numbered 2346/5250. This is some kind of special refractor, really cool pointilism effect. Any refractor is fun to photograph, however; you never know what interesting patterns you get based on how the light will hit it. Joey Vierra pitched ten seasons of professional baseball, mostly in the Reds and White Sox organizations. In 412 games he went 29-24 with 36 saves and a 3.38 ERA. 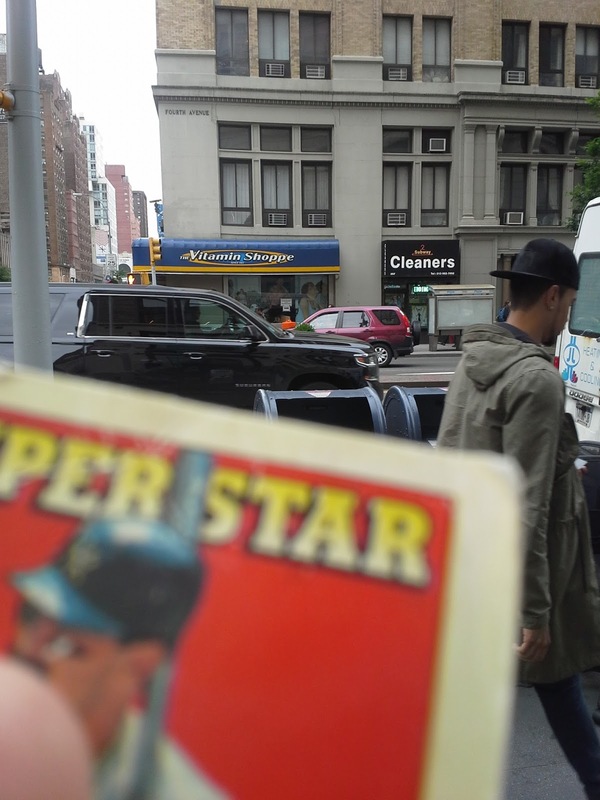 Now a special education teacher in Hawaii, he kindly answered my question about his favorite baseball card. "Chris Lombardozzi had a baseball card of himself eating a burger. The company that made the burger is the competitor of the company that printed the card. It's a classic." Here is a card of Vierra from my collection. When President James Garfield succumbed to his wounds several weeks after being shot by an assassin, Vice President Chester Arthur was inaugurated as President in his New York apartment at 123 Lexington Avenue. He served well if mostly anonymously, and is best remembered for his progress in civil service reform. I have one card of Eude Brito, from 2005 Donruss Signature. Playing career: Eude Brito pitched for the Phillies in 2005 and 2006. In eleven games he went 2-4 with a 5.40 ERA. Where he is now: Anyone know where Eude Brito is now? Google Autocomplete results: He is first when you type Eude , ahead of EUDE Business School, a postgraduate school in Madrid. Another prominent Eude Brito is a corrupt politician in Brazil. Coming up next: The next profile will be Chris Britton. 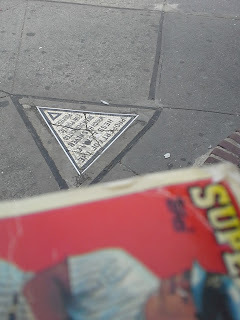 At the corner of Seventh Avenue and Christopher Street is a rather interesting mosaic, known as the Hess Triangle. It goes back to a property dispute between the Hess family and the city of New York in the 1910s when the city seized some of David Hess's property via imminent domain in order to expand the subway. Later on the family realized that a small triangle of land was not included in the survey. They refused to donate the land to the city and instead installed a mosaic in 1922 which reads "Property of the Hess Estate which has never been dedicated for public purposes." 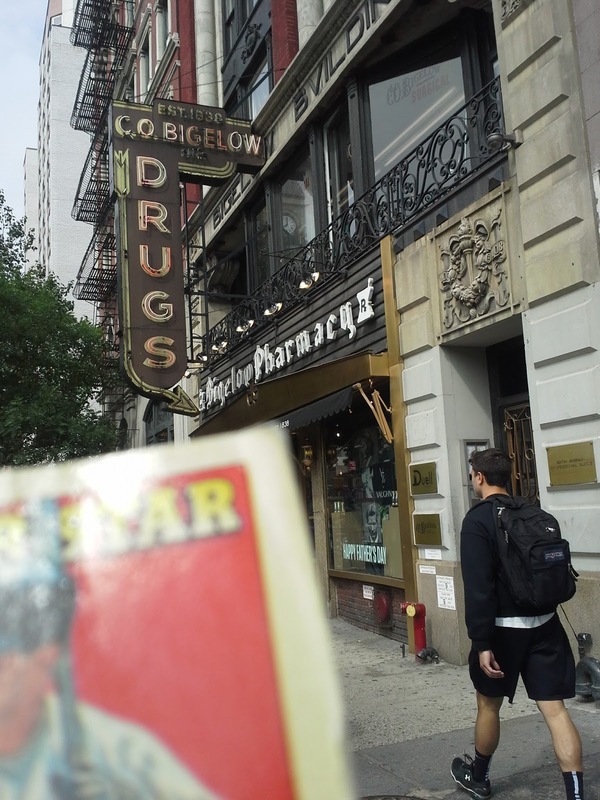 The 500 square inch plot, the smallest individual plot in New York, was later sold to Village Cigars, who still own it today. Over ninety years later this small act of defiance remains. I have five cards of Bernardo Brito. This one is from 1993 Pinnacle. Playing career: Bernard Brito put together nine consecutive seasons of 18+ home runs in the minor leagues before finally being called up to the Twins at the age of 28 in 1992. 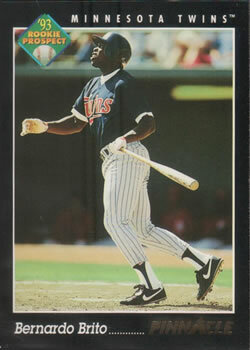 He played for the Twins for 40 games between 1992 and 1995, hitting .219 with 5 HR and 12 RBI. However, in 1,470 minor league games the slugger hit .270 with 293 HR and 1008 RBI. A fuller account of his career can be found at The Greatest 21 Days. Where he is now: Head coach of the Dominican Baseball Academy in San Cristobal. Google Autocomplete results: He is second when you type Bernard Br, between Bernard Britto, a filmmaker, and Bernardo Braga, an MMA fighter. Another prominent Bernardo Brito is a finance professional in New York. Coming up next: The next profile will be Eude Brito. Back in the eighties there were several shops that specialized in do-it-yourself custom framing. 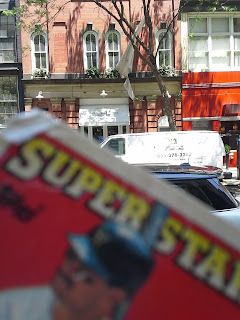 One of them was Frames by You on Eighth Avenue by 20th Street. 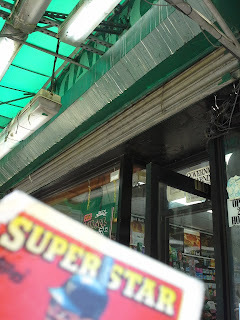 They are long gone but you can still see their sign under the awning for the Chelsea Food Mart. Here is what the store looks like today. Down the street this Steakhouse sign caught my eye. There is no steakhouse at the location, just a closed-up Italian restaurant and a closed-up French restaurant. I have seven cards of John Briscoe. This one is from 1991 Score Traded. 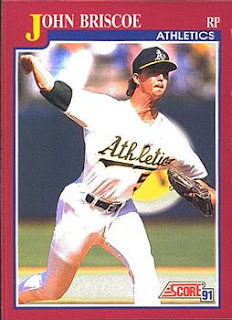 Playing career: John Briscoe pitched for Oakland from 1991 to 1996. In exactly 100 major league games he went 5-5 with 2 saves and a 5.67 ERA. Where he is now: Senior Instructor at Frozen Ropes in McKinney, TX. Google Autocomplete results: He is second when you type John Brisc, between John Briscoe Weatherford, referring to the oilfield company’s former CFO, and John Briscella, a 3D printing artist. There are no references to the ballplayer on the first page of Google results; the first is for an environmental engineering professor at Harvard. Coming up next: The next profile will be Bernardo Brito. 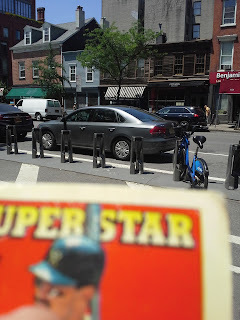 I have complained a few times about the sameness of the recent Topps sets, as well as praised several times the eccentricities of the early 80's Fleer sets. This card reminded me more of the latter than the former, with it's off-center photo of Gary Sheffield awkwardly avoiding an inside pitch. The only thing it needed was to be blurry and it would have fit right into 1982 Fleer. From this card I learned that Didi Gregorious's father is also named Didi and was a famous pitcher in Curacao. I also learned that Didi was originally a Red. One slightly sad thing about being a grown-up is not knowing all the career moves of a starting player on my favorite team. Here's a shirt that just screams 1990's. 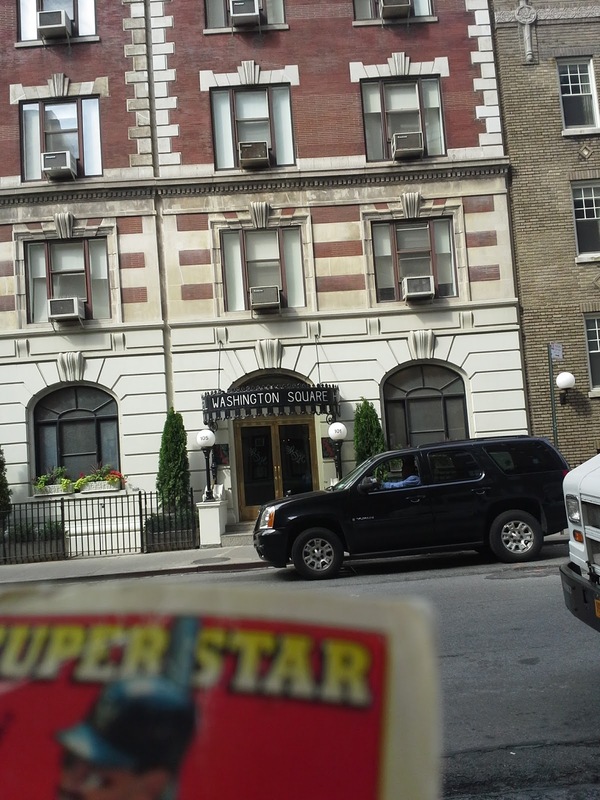 It's very unusual to see wood-frame buildings in Manhattan. 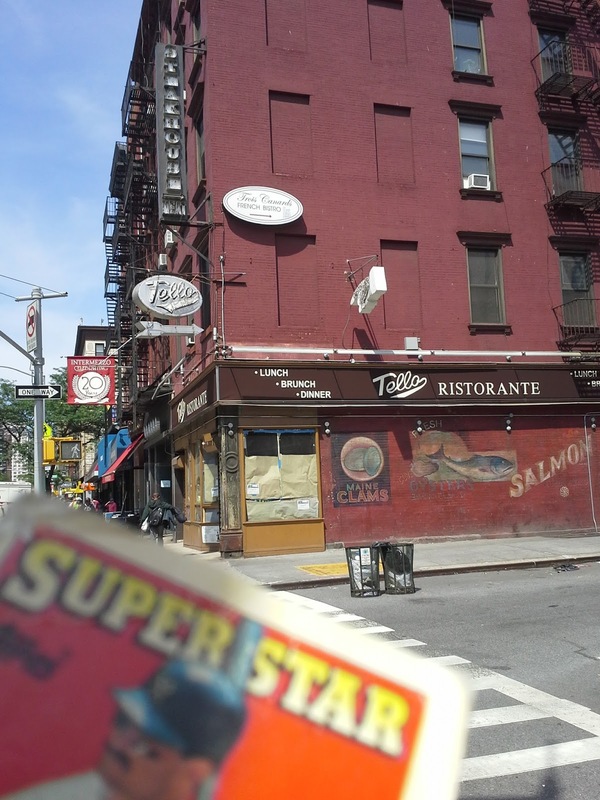 The three buildings in the center of the photo (185-189 Ninth Avenue) were built in the 1850s-1860s and are some of the last survivors of that bygone era. The brick building on the corner of 21st Street is even older, built in 1832. I have one card of Dante Brinkley, from 2008 Multi-Ad Albuquerque Isotopes. Playing career: Outfielder Dante Brinkley played in the Mets and Marlins organizations from 2003 to 2008. In 579 games he hit .272 with 54 HR and 253 RBI. Where he is now: Owns CBL Sports in Chicago. Google Autocomplete results: He is sixth when you type Dante Bri, between Dante Basco, an actor, and Dante Brittanica, referring to an encyclopedia entry for the Italian poet. Another prominent Dante Brinkley is a youth football player in Connecticut. Coming up next: The next profile will be John Briscoe. I noticed this "sign behind a sign" at 17th Street Food Market on 7th Avenue. Appears to say "Adamici". 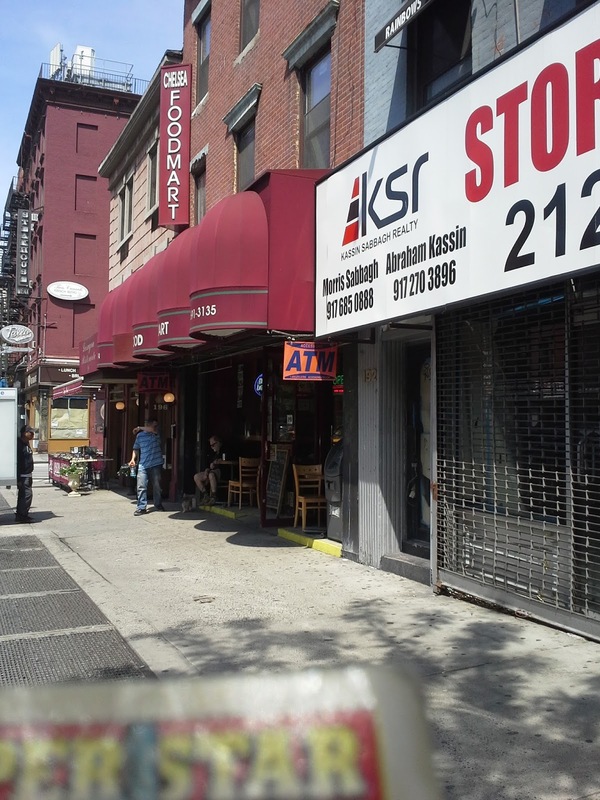 I found one reference on the internet - an expired ebay listing - that mentioned a handbag bought at Adamici Shoe on 17th street in 1994. I have four cards of Brad Brink. This one is from 1990 ProCards. Playing career: Brad Brink had high expectations as the Phillies first-round draft pick in 1986, but injuries limited him to just 145 minor league games and 14 major league games over his nine-year professional career. In his three major league stints with the Phillies and Giants he went 0-4 with a 3.54 ERA. Where he is now: A second-grade teacher at Carroll Fowler Elementary in Ceres, CA. Google Autocomplete results: He is fifth when you type Brad Brin, between Brad Brinkley, a country musician, and Brad Brinkman, a San Diego realtor. Another prominent Brad Brink is an engineer in San Francisco. Coming up next: The next profile will be Dante Brinkley. Well, now it's just another trendy restaurant. But the faded painted signs on the second level attest to the building's function in the 1890s and early 1900s. 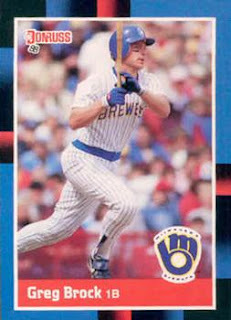 I have one card of Tyler Brilinski, from 1990 ProCards. Playing career: Power-hitting first baseman Tyler Brilinski played in the Oakland organization from 1985 to 1989, which was the wrong time and organization to be a power-hitting first baseman, blocked as he was by Mark McGwire. 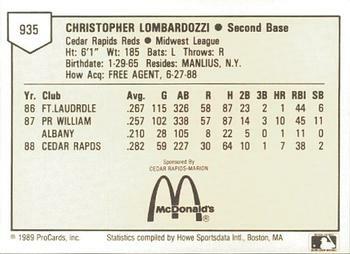 In 1986 at Class-A Modesto he hit .324 with 27 HR and 91 RBI. Though he put up pretty good home run totals as he moved up to AA and AAA, his batting averages plummeted and he did not make the major leagues. Where he is now: Founding Member & Partner at Watermark Wealth Strategies in Phoenix. Google Autocomplete results: He is fourth when you type Tyler Bril, between Tyler Briley Hockey, a youth hockey player in Maryland, and Tyler Briley, a youth football player in Louisiana. There do not appear to be any other prominent Tyler Brilinskis. Coming up next: The next profile will be Brad Brink. Don't worry it's not a real guy. Apparently this jump has been going on for years, I wonder when he'll finally hit the ground.